On August 15, 2009, there will be an event like nothing San Felipe has ever seen. Under the promotions of VIP Earth Events out of Las Vegas, Nevada, and sponsored by Mexico Living, Island Rhythms Production will be performing at the JollyMon Bar, 7 p.m., in north San Felipe. Island Rhythms Production has traveled and toured through 16 countries and features musicians from the Caribbean Isles. The founder of the group, Noel Lawrence, is son of Raymond Lawrence. Ray and his two brothers, Gerald Lawrence and the late Kenneth Lawrence, were all original Trinidad Steel Drum Band members. They began touring various parts of the world back in 1958 beginning in South America. 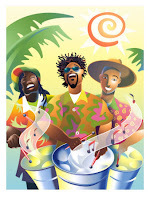 They were the first known steel drum band in the United States back in 1960. Authentic Caribbean sounds inspired by years of experience will fill the night at the JollyMon, with drink specials and appetizers themed for the event. The band has also played at many famous attractions in the United States, including Disneyland, Universal Studios, Magic Mountain and Sea World, as well as on cruises all over the world. With unique style, the bands' repertoire includes: Soca, Calypso, Salsa, Rhythm and Blues, Country Western, Rock and Roll, Classical and Jazz music. But this night? It’s all Caribbean Steel Drums! Tickets for the event are $20 in advance, $25 at the door. We are limited to 180 occupancy, so get your tickets fast, or you will miss out on this incredible event. You can get tickets by calling (686) 231-4921, emailing vipearthevents@gmail.com or order online securely with PayPal by visiting the VIP Earth Events website at www.VIPEarthEvents.com. VIP Earth Events was founded by locals Bill Maine and Lisa Shannon to provide events worldwide, and they decided to start in their own backyard! It is a division of the parent U.S. corporation, GreetScape, Inc. JollyMon Bar is owned and operated by John and Lynn Hall, also proprietors of the Sundance Deli. For more information about upcoming events as the schedule becomes available at the JollyMon, please visit the VIP Earth Events website. WASHINGTON -- The government says new U.S. home sales rose by the largest amount in nearly nine years last month, in another sign the housing market is finally bouncing back from the worst downturn in decades. The Commerce Department says sales rose 11 percent in June to a seasonally adjusted annual rate of 384,000, from an upwardly revised May rate of 346,000. "Pancho Villa Yacht" to be in the "2010 Rocky Point Calendar"
Just a quick note to let you have another terrific website for Rocky Point. This is with the "Pancho Villa Yacht." The above boat is owned by Ray & Annette Ramirez. She e-mailed this morning and asked if we want to use a photo of Ray in the 2010 Calendar, where he is riding a "whale shark." They live full time in Rocky Point, and also have a home in Mesa, AZ. Annette said the yacht is 57 ft. long and can accommodate up to 45 people for fishing trips, trips to Bird Island (snorkeling), and other trips (see their website). Lea Lubeck, (Flagstaff), of Seafari Tours, is already submitting a picture of the Pancho Villa (besides Seafari photos). Tammy & Roland Mondragon are submitting photos of their Kayak Tours. Needless to say, I can't say enough about all the nice people we have met who live and work in Rocky Point, or help out behind the scenes! We are meeting people left and right on "FACEBOOK for the Rocky Point Businesses" and also the new site PENASCO NOW for the businesses. 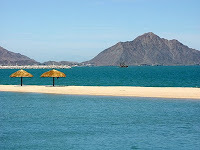 With Rocky Point being on the Sea of Cortez, it will be wonderful to show in the calendar all the sea sports available there. San Felipe Weather...Oh The Weather We Had. The San Felipe way. Work late if you can and sleep through the morning. Mornings for some reason can be the hottest time of the day, and I am all for avoidance. Mid day temperatures at Weather Central were in the upper 90s, with enough humidity to say Spanish flash cards, a movie, inside with the AC. Around four the temperature had dropped a few degrees and the humidity burned off a bit, breeze kicked up and all was well with the world again. Looks like we are in for a slow warming trend with sunny skies over the next several days...Very Pleasant Right Now and Its Saturday night! ENJOY! Clear. Low: 28 °C . Wind South 10 km/h . Heat Index: 33 °C . Clear. High: 38 °C . Wind East 10 km/h . Heat Index: 39 °C . Clear. Low: 29 °C . Wind West 14 km/h . Heat Index: 32 °C . Clear. High: 40 °C . Wind ESE 10 km/h . Heat Index: 42 °C . Clear. Low: 30 °C . Wind West 14 km/h . Heat Index: 35 °C . Clear. High: 40 °C . Wind ESE 14 km/h . Heat Index: 40 °C . Clear. Low: 27 °C . Wind WSW 14 km/h . Heat Index: 33 °C . Clear. High: 38 °C . Wind WSW 10 km/h . Heat Index: 37 °C . Clear. Low: 28 °C . Wind WSW 14 km/h . Heat Index: 31 °C . Clear. High: 37 °C . Wind ESE 14 km/h . Heat Index: 37 °C . Clear. Low: 27 °C . Wind WSW 10 km/h . Heat Index: 31 °C . Scattered Clouds. High: 37 °C . Wind ESE 14 km/h . Heat Index: 38 °C . Ahhh. Another spring in San Felipe coming to an end and the beginning of the summer feels like it is upon us. Semana Santa has come and gone without much incident, from what I heard. The usual pilgrimage to San Felipe brought business to downtown and parties to the beach. In celebration of Earth Day, April 22, and in an attempt to clean up the beaches in our little town, Casey Hamlin hosted a beach clean up and Mexico Living helped pickup and launched the Beautiful San Felipe T-shirt program to fund such clean up projects. Many volunteers showed up with gloves in hand to pick up trash all along the beach. Personally, I got about 8 pounds of garbage! So, imagine how much more was actually picked up! The Marina Police were also there in full force getting all the big stuff. (California Dental & Optical’s) David and Melina’s wedding on April 25 could be dubbed the social event of the year. 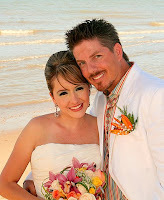 They wed on the beach and had an amazing reception near their home. Simultaneously, Agave Blues had a private party to entertain in the South Campos in celebration of Ruben’s birthday. ¡FELIZ COMPLEAÑOS, RUBEN! Of course, on band’s return from down south, they stopped in at the wedding to wish their friends lifelong happiness! Jim Moore and Bill Maine performed Dave and Melina’s band-favorite song, Song For You. It was truly amazing. Club de Pesca’s 7th Annual Chili Cook-off brought hundreds of people out to try San Felipe’s finest chili creations. Smokin’ Tonsils won this year, with the People’s Choice going to South Campo’s Rob Nikel, Georgia and Jim. Agave Blues played music well into the late afternoon and even welcomed local Ian Thompson to the stage to sing his Rolling Stones favorites. And let’s not forget the San Felipe Ladies’ Yacht Club who sang backup for the boys on I Shot the Sheriff. Many thanks to Pancho and Jorge Limon and Joseph Malek for their hard work and dedication to make the cook-off a great success...AGAIN! For some local schedule updates, Mac and Nan’s Karaoke is now being held at Playa de Oro’s Beach Bar each Saturday night. They are always great hosts for this San Felipe pastime. Porky J’s is now open at Fandangos at 2 p.m. each day the bar is open. You will find amazing pork ribs and BBQ there. North folks, don’t forget about Blowin’ Smoke for your BBQ delights! Jolly Mon Bar, located in Plaza Paraiso (KM 178.5) has something for everyone EVERY NIGHT OF THE WEEK! San Felipe’s Best Karaoke 2008, Sing-out Sisters and Chuey, can now be found there each Tuesday at 6 p.m. Check the Jolly Mon calendar left in your mailbox or on their door to see what you might want to participate in. And lastly, let’s hit this swine flu right in its pig nose! There is no swine flu in San Felipe, and according to the Mexican health officials in Mexicali, there have been no reported cases of this strain of the virus in Baja. Happy Summer, Everyone! just north of the lighthouse. Yesterdays muggy overcast weather is followed today by more cloudy weather but less humidity. Following yesterday's extremely high tide (see Pictures here) the evening temperature dropped into the upper 80s during the late evening. Looks like of 97 degrees for a high here at Weather Central today. Tomorrow expect sunny skies and an increase in temperature, lets say an even 100 degrees. Sunday expect some clouds to return. It is a go and do it weekend with high tides for swimming and low tides for clamming...Enjoy! Chance of Rain. Partly Cloudy. High: 34 °C . Wind SE 14 km/h . Chance of precipitation 20% (trace amounts). Heat Index: 38 °C . Scattered Clouds. Low: 27 °C . Wind ESE 10 km/h . Heat Index: 31 °C . Chance of Rain. Scattered Clouds. High: 37 °C . Wind ESE 14 km/h . Chance of precipitation 20% (trace amounts). Heat Index: 39 °C . Clear. Low: 28 °C . Wind WSW 10 km/h . Heat Index: 32 °C . Clear. High: 38 °C . Wind ESE 10 km/h . Heat Index: 42 °C . Clear. High: 40 °C . Wind East 10 km/h . Heat Index: 42 °C . Clear. Low: 29 °C . Wind WSW 14 km/h . Heat Index: 34 °C . Clear. High: 39 °C . Wind WSW 10 km/h . Heat Index: 37 °C . Clear. Low: 27 °C . Wind West 14 km/h . Heat Index: 31 °C . Clear. High: 37 °C . Wind ENE 14 km/h . Heat Index: 36 °C . Clear. Low: 26 °C . Wind WSW 10 km/h . Heat Index: 30 °C . Over the next few days we will experience cooler actual temperatures, thanks in part to cloud cover, but the additional humidity is likely to put our heat index numbers up over the 100 degree mark. Our winds are breezing in from the south and will hopefully help keep it bearable. A very high tide is predicted for this afternoon. Enjoy the day by the beach and see the water much higher than normal...Enjoy! Overcast. High: 35 °C . Wind ESE 18 km/h . Heat Index: 42 °C . Partly Cloudy. Low: 27 °C . Wind SSE 10 km/h . Heat Index: 31 °C . Scattered Clouds. High: 36 °C . Wind East 14 km/h . Heat Index: 44 °C . Scattered Clouds. Low: 28 °C . Wind SW 10 km/h . Heat Index: 32 °C . Partly Cloudy. High: 38 °C . Wind ESE 14 km/h . Heat Index: 39 °C . Scattered Clouds. Low: 29 °C . Wind West 14 km/h . Heat Index: 32 °C . Clear. High: 39 °C . Wind East 10 km/h . Heat Index: 39 °C . Clear. Low: 30 °C . Wind WSW 14 km/h . Heat Index: 34 °C . Clear. High: 42 °C . Wind ESE 10 km/h . Heat Index: 40 °C . Clear. Low: 29 °C . Wind WSW 10 km/h . Heat Index: 33 °C .